Bedrooms: 3 "Potential to add two more." 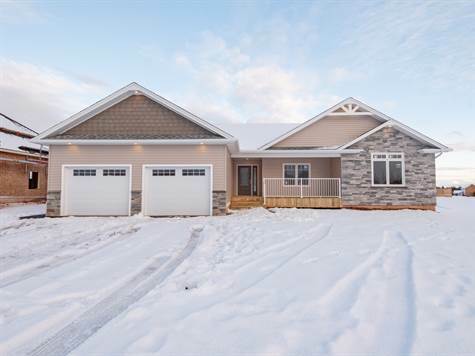 Brand new rancher in the increasingly sought after Sunrise Cove area of Cornwall. The large front entry area leads to the open living, kitchen and dining, with the living area boasting a vaulted ceiling, lots of natural light and an open hardwood staircase to the basement. The kitchen offers a large island, with breakfast counter, gorgeous Tops to Floors custom cabinetry and stylish Samsung kitchen appliances. The ample dining area is open to the kitchen and leads to rear deck. There are two good sized bedrooms and the main bath w/laundry on one side of the home. The huge master suite is on the other side and is fashionably adorned with a tray ceiling, a sizeable walk-in closet and en-suite bath with large shower and a double vanity. This home is efficiently heated with a combination of convect electric heating and a heat pump for additional heating and cooling. There is a real sized double garage and a full basement, perfect for future development and the addition of two more bedrooms if desired. Definitely worth checking out! Make the call to arrange a viewing today.